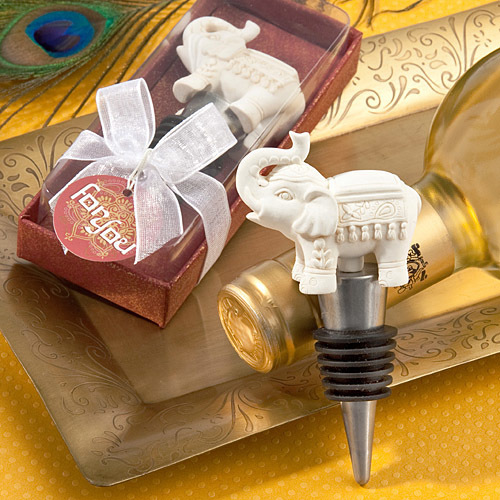 Each elephant wine stopper measures 4” x 2”. Crafted in durable, pewter-finish poly resin, the majestic elephant charm has his trunk up-swung for good luck. The elephant has sculpted Asian/Indian-inspired details including a festive headdress and blanket. The conical bottle-stopper base is made of stainless steel, wrapped with a black rubber gasket for a tight seal. Arrives packaged inside a clear topped box, with a gold and red base. Box is wrapped and tied with a white organza ribbon and an attached matching design “For You” tag.